Includes windshield suction cup mount and flexible arm for an easy and versatile installation. Can increase fuel economy (we have customer testimonials of up to 5 mpg increases on our website.) Mileage increases can vary and are not guaranteed. Reads and erases diagnostic trouble codes. Easy Installation: Installs in 20-40 minutes by plugging into the diagnostic port under the driver side dash and programming your vehicle's ECU. After programming is complete, the unit can be left plugged in and used as a monitor while driving or un-plugged and put away for future changes. You do not need to leave it plugged in to keep the vehicle tuned. 9/25/12: NEW F150 Eco Boost Features and Tunes: Economy Tune added, Adjustable shift settings, and more! 12/15/11: 2011-2012 F150 Eco Boost V6 Now Supported. Increase up to 42HP and 55TQ at the wheels. Bully Dog Parts.com is your best source for brand new Bully Dog diesel performance parts. 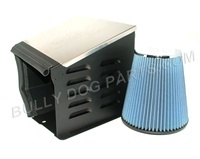 We carry the full line of Bully Dog diesel parts. From the Bully Dog Triple Dog GT, to the Bully Dog PMT, to their Six Position Chips. We also carry their hard parts such as the Bully Dog RFI Rapid Flow Induction Systems . Bully Dog intakes and exhausts act as a perfect compliment to their diesel performance tuning modules and programmers. And when you add that power, you may have to beef up your transmission with one of their Bully Dog Shift Enhancer Kits. We carry only new stock and use our volume buying power to strive to give you the best value and service for Bully Dog diesel performance parts. All products are backed by the Bully Dog manufacture warranty.